Driven by the results of its strategic plan 'Performance with Meaning' over four years, which has allowed it to double its activity and become the no. 1 French cooperative wine group, Val d’Orbieu-Uccoar is embarking on a new phase in its development. 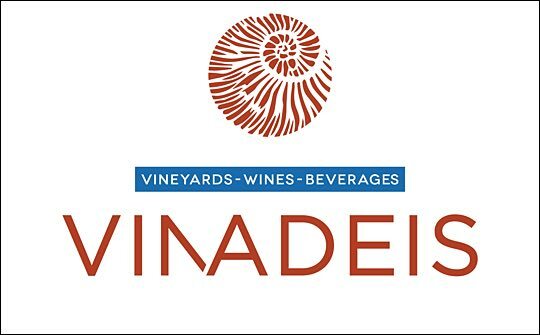 The group is adopting a new corporate identity and umbrella name – Vinadeis. It is also entering a strategic partnership with InVivo (the No. 1 French agricultural cooperative group) with a view to accelerating the emergence of a French player of international size in the wine sector. Created by seven winegrowers from the Corbières in 1967, the group today brings together more than 1600 winegrowers, 120 employees in village cooperatives and almost 400 other employees. It also relies on more than 320 wine production partners from Aquitaine to the Rhone valley, as well as abroad. With so much wealth, and so many identities and trades (cooperatives, merchants, estates, industrial units and subsidiaries in the Languedoc, Bordeaux and abroad), it was necessary to unify its message and identity around a unique and inspiring banner. The new corporate logo, an ammonite symbol designed by Bayadére, a branding agency in Paris, was 16-18 months in the making. “We thought it was important to create a new identity for the market to get a better understanding of who we are,” Girard explains, “because it’s not so easy to grasp the extent of the whole group’s activities. “The group today has 1600 winegrowers united around 45 estates and châteaux and 11 wineries – they are gathered in corporative format, and they are the shareholders of our new baby, the Vinadeis, backed by 17,000ha of vines plus numerous partnerships in Aquitaine and the Rhône Valley. We have more than 400 employees and a turnover of €268m (73% France / 27% export to around 60 countries). “For the market to better understand who we are, we believed it absolutely necessary to propose just one flagship identity so we can say we are Vinadeis, we have big vineyards with many wine growers working every day and we have all the bottling and marketing skills to go to the market. And now if you ask ‘who is the biggest French winery?’ you have the answer. The next step for the winery was to show some more iconic, small production wines. Black Reserve, a new premium range of one white and seven red limited edition wines from the company’s Languedoc Roussillon vineyards were launched at Vinexpo this year, along with the new identity. “We don’t aim to be making big Euros with these wines, and we won’t by the way, because it’s small quantities – 200 hundred cases here, 500 cases there – the ambition is to show who we are as wine makers and what we can achieve, and to give us and, therefore, all our wines, greater credibility in the market." Girand joined the company five years ago. Since he joined the business the export business and profits have tripled. Born in Cognac were his family has vineyards, he subsequently spent 24 years abroad, with spells living in Morocco, the UK, Singapore, India, Shang Hai and Hong Kong. “I started my career at Danone,” he says, “you learn a lot from these big companies. I also worked for a small spirit company in Cognac on the export side. Then I set up a consulting firm in Hong Kong, a long time ago, helping people penetrate the Asian market by putting together a good business plan. Some of my customers were wine companies, but also supplier companies such as bottle makers, yeast companies etc., so came to know very well the wine industry in Asia. I set up the first 100% foreign-owned, import company in China in 2000 – no partner, just 100% owned by me. After selling this company I worked five years for a marketing agency. “So, to summarise, I think I am strongly rooted in the vineyards by birth, but also I love working in other cities in the world. This company carries the values I love…being rooted in the vineyards and travelling the world to share experience, to share products…this is really something I like and this job gives me the opportunity to do that."